Robert Downey Jnr returns as the ingenious Tony Stark in this year’s must see blockbuster. After finally settling down with girlfriend Pepper Potts (Academy Award winner Gwyneth Paltrow), Tony’s life is thrown into turmoil when an unknown enemy shatters his world. Embarking on a journey to find those responsible, the cunning entrepreneur will be tested at every turn. Forced to rely on his wits to conquer evil and exact revenge, Tony must reexamine his life and answer the question that has secretly plagued him all along, does the man make the suit or does the suit make the man? Downey Jnr and Paltrow are joined by an all star cast including Guy Pearce (The Hurt Locker) and Ben Kingsley (Schlinder’s List) who helped make Iron Man 3 the fifth highest grossing feature film of all time. The 'Iron Man 3' competition has now closed. Winners will be announced shortly. Competition opens at 5pm AEST on Sunday 25th August 2013 and closes at 11:59pm AEST on Sunday 1st September 2013. Five winners will be chosen at random on Monday 2nd September 2013. To successfully win, entrants must fulfil the above entry conditions before the time the competition closes. Current members/followers are eligible to enter the competition. Only one entry per person. Only one winner per household. To be a valid winner, the entrant must not have won a prize from SWITCH within the last 28 days. Each winner will receive one Blu-ray copy of 'Iron Man 3'. By entering, you agree to receive occasional emails from SWITCH in the future. If you decide to unsubscribe from these updates, any further entries will not be applicable. Only Australian residents are eligible to enter. 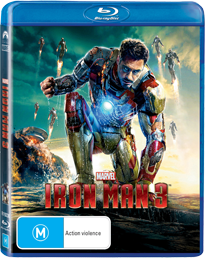 'Iron Man 3' is available on Blu-ray & Digital Copy Plus, DVD and Triple Play (3D Blu-ray, Blu-ray and Digital Copy Plus) on Wednesday the 28th August 2013 from Marvel.